Audio Technica famous for there improvements to there sound quality, with addition improvements to make sure that your sound experience is better, with tracking and reducing resonance. The ATLP60XUSB, comes with a flexible deck and comes fitted with Audio Technica's quality cartridge that benefits from high-quality sound and accuracy. The Phono Pre-amp is built-in, it can connect to almost any Hi-fi Audio Speaker System. With this Phono pre-amp it boosts and improves the overall signal to line level, meaning that you can connect it with a AUX Cord, with its supplied convertor has you covered. If you simply want to use your own amps, phono amp then simply switch off it on the turntable. Wheather you have a mac or pc, don't forget that you can store your music from your records with the handy usb device, and you can convert all your vinyl music into MP3. From here its up to you, store them on your computer, put it on a CD, or put it on your Music Player, its up to you and you can use it anytime. 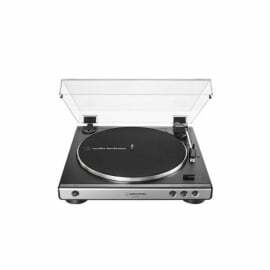 The Deck has a automatic playback, which means it automatically by the time it ends the record, its resets and returns the arm at the end of the record. You just select the size of either 12 or 7 and you are good to go.